You’re frazzled. You needed this time. When you return, your partner tells you about the day they had. Your youngest was funny, played well and ate all his lunch. You’re happy to hear that (if a little peeved that things went so perfectly) and you settle in to enjoy spending time with them. But almost immediately the mood changes. Your youngest takes a marker and colours on the table. You set a limit. He yells no, and then throws the box of markers all over the room, and just for good measure, some at you. Your partner is incredulous. “He was fine with me,” he says, holding up his hands. “It’s all about emotional safety,” says Madeleine Winter, Certified Instructor with Hand in Hand Parenting. “When we are alone with our children, we are doing our best to meet their needs – physical and emotional. But it is just not possible to do it perfectly. Inevitably, things happen that cause a child to accumulate tension – things we have no control over, or (dare I say it!) things we do wrong, or, at least, not quite right in their eyes. But when we are the only adult around caring for them, they are completely dependent on us. They are relying on us. So even if they have feelings about us, or something we have done has been hard on them, they’ll often tamp those feelings down, because when we are all they have got, they can’t safely go there,” says Madeleine. “The return of another parent or loved one ups their safety levels,” she says. All of a sudden, children perceive an added security that feels “safe enough” to have those feelings bubble up. Working with parents as an Instructor with Hand in Hand Parenting, Madeleine often hears of children getting upset when two or more adults are around. “It’s the presence of another adult that brings the feelings out,” she says. Ask Yourself Who Sees Your Children More? There can another dynamic at work too. The way our society is organised, the balance of paid work and caring between parents is often not even and one parent will spend more time with the children than the other. In the example above, while the children had a great time with Daddy, and everything was going swimmingly, they don’t spend nearly as much time with Dad as they do with Mummy. There’s often not as much emotional safety with the parent who is not the primary carer. So despite having a great time, they are a little more careful to keep their feelings under wraps for the day with Dad. When mom arrives home, the children “check-in” to the extra sense of safety in their relationship with her, and then let loose. “Sometimes, when children seem to regularly go off-track with one parent and not the other, it can be a sign that their relationship with the parent they are ‘making trouble’ with is closer,” says Madeleine. Madeleine says it’s got nothing to do with whether you are daddy or mummy – whoever spends the most time with the children is often favored, and upsets may show up more readily when that parent is around. “You can treat it as a kind of badge of honour: your child feels safe enough to show you that they are in trouble, and they are hopeful that you will be able to give them a hand with it,” says Madeleine. What About When Children are Clingy? On other occasions, if a parent has been away all day, and arrives home, a child quite often will absolutely refuse to go anywhere near them. It’s not that one parent is “doing better” than the other. It’s not that your child hates the parent that just arrived home. When you arrive home and your children don’t want a bar of you, it’s paradoxically because your arrival just made it safer. “What your child is feeling, when it is safer, is how much they missed you,” Madeleine says. Since dads often tend to be the ones away, it can look like the children don’t want Daddy. But it can happen to whichever parent is away more. Sometimes we see another switch. Your children seem to reserve all of their upsets for you, the main caregiver, and then turn into angels when your partner arrives home. Feel familiar? From the minute your partner left this morning you haven’t had a moment. At morning snack you gave apples not bananas and your daughter had lots to say. She DOES NOT want apples! Then she refused to take a nap. Then her usually favourite princess dress up was not the superhero costume she really wanted, and that has mysteriously gone missing. After throwing a tantrum over the costume, she emerges from her sister’s room with a comic. Your oldest hasn’t looked at it in months, but now insists it’s her favourite and she needs it. And she means right now! By the time you sit through dinner with one child complaining about the menu and another sullen and silent, you can’t wait for the day to end. When your partner comes back, he says he’ll bath them and read a story. You guffaw and wish him luck! But 20 minutes later, the scene looks like it comes from a movie called “Perfect Parent.” Both kids are wrapped up in bed, your partner is telling a story using a whole range of funny voices, and both girls are giggling. “Do they really like their dada better than me?” a voice echoes in your head. And kids are smart. Your partner came home looking fresh and bouncy, as far as your kids can tell. Who wouldn’t take that as an opportunity to play? Never rely on a constant. Sometimes, one parent will take the brunt of a child’s upsets, and then the other parent will get a turn. If you are parenting singly, you’ll see this happen with relatives, teachers, or sometimes, close friends. “I think what is important to understand is that it is complex, changing, and is fundamentally about the fact that as carers of children, we are in the centre of a complex and dynamic set of relationships,” says Madeleine. And it is not just about the children! We may be parenting as a single parent, which has it’s own challenges. But if we are parenting with others, our children’s emotional safety depends in a big part on the strength of our parenting relationship. “So often, parents come to me with troubles in their relationship with their child, but it doesn’t take long for it to become clear that the relationships with the other adults in the family dynamic are at least as challenging,” Madeleine says. Madeleine says it is to be expected that under these circumstances things get tight. As well, parenting pushes us up against some of our own earliest struggles. “Before we were parents, we might have been able to avoid or “manage” some of these difficulties. Once we are parents, though, our children’s needs, and our deep commitment to hanging in there to meet those needs. 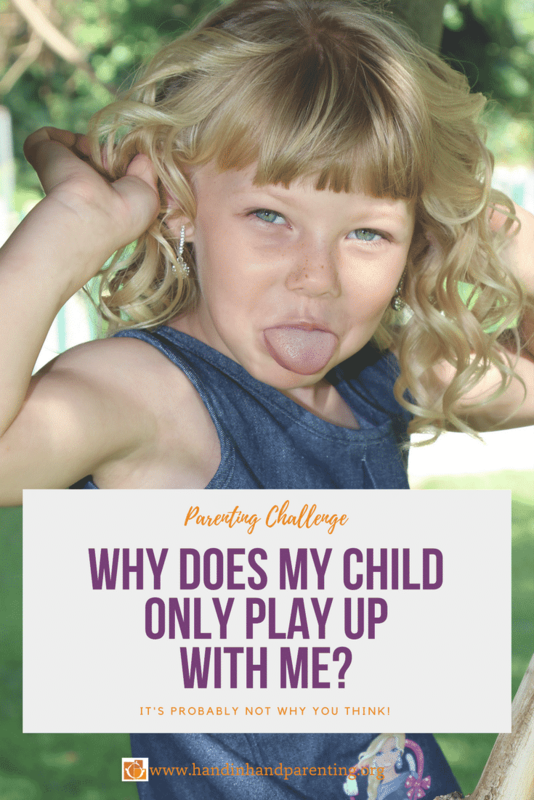 What To Do When a Child Plays Parent Favorites? A badge of honor it may be but constant taking of sides, big upsets, attention-grabbing behaviour or disruptiveness when another caregiver comes home can be draining. Added to this, tensions with your parenting partner over how to handle it can be deeply demoralising. What tools or strategies can parents use when kids seem to be taking sides, acting up and aiming it all at one parent? Or when you seem to be constantly on the edge of an argument with your partner about how to handle it? When this happens, their behaviour has become rigid, and they are full of feelings. They can’t think well. They can’t make good choices – the kind of choices that will have everything go well. The behaviour can be annoying, but is sometimes unavoidable. “They aren’t out to get you, they are actually choosing to show you that they need you now,” Madeleine says. “It’s hard when we feel hijacked by our children’s difficulties. One of the first things I’d suggest is for the adults involved to get some Listening Time,” she says. A Listening Partnership is a great way to get and give support as you listen in turn to each other. The times when our children show their difficulties can be predicted, and we need to plan for those times. But we often feel overwhelmed, and are vulnerable to hoping that it won’t happen again, even when it has happened every other time. Venting it all to a Listener who doesn’t offer solutions, but just assists you to offload the tension, can leave you able to think much more clearly. Once you have got the initial frustrations off, you can use your Listening Time to review what happens in the interactions with your children, look for patterns, and plan for how you will deal with the difficulties. When you are working towards resolving a persistent difficulty in your relationship with your child, focus on increasing your “connection time” with them. “A deeper sense of connection with their caregivers will sometimes be enough to ease difficulties. A tool we call Special Time is a great way to build connection. One child, and one adult, or maybe both adults, play just the way the child wants to play, letting the child take the lead, delighting in them and enjoying their time together,” Madeleine says. Try some Special Time just after you arrive home to help re-connect with a child who has been away from you all day. On days you need to be away, you can have Special Time with your child and the adult you plan to leave them with, which helps them connect with the person who will care for them. Perhaps you can’t handle a big upset well when it is nearly dinner time and your co-parent has just arrived home, but there maybe other times that you could listen. Your child might get upset during the day – when there are peas instead of corn, over having to share a toy, over nap time, or waking from nap time. It’s really worth paying attention at those times, just by listening and not moving immediately to try to solve the problem. At Hand in Hand we call this Staylistening. Read a free chapter on Special Time from the book Listen: Five Simple Tools To Meet Your Everyday Parenting Challenges. You can read more about building your parenting partnership here. Madeleine also recommends doing smaller things to ease things between you. When she was home in the early years and her partner was working, they would talk on the phone on his drive home, checking in, connecting and sharing how the day had gone. Sometimes it was a little tricky combining this with her daughter’s late afternoon and evening routine, but it meant that when her partner got home, she and he were at least a little connected, and he could focus on reconnecting with their daughter. And Madeleine has another secret ingredient she uses in her relationship. Surprising as it might sound, they do Special Time together every now and again. “Just tell your partner, “Let’s make 20 minutes each where we do just exactly what you want to do. Then let’s swap, and you can be with me while I do what I want to do.” Explain the rules of Special Time – unconditional delight, general enthusiasm, interest and warmth, no comments, judgements or criticisms. “It works wonders,” Madeleine says. You’ll find a sweet story about adult-to-adult Special Time here. Join us for our Parents Intensives and work one-on-one with a Hand in Hand Instructor to decode and learn how to parent through your family’s challenges. Madeleine works with parents of children from babies through to teens. “Family life is so complex,” she says. “You deserve support in working through what might be going on. If you are struggling, or not sure, it’s a great idea to book a Consultation with a Hand in Hand Instructor. I also recommend building a group of parents around you, to share experience and emotional support. Parent Support Groups are a great way to do that.” Madeleine regularly runs these groups by phone/video conference – you can join from anywhere in the world. Find out more.